I had grand plans for a plethora of witty year end posts. Then I started getting all the January magazine issues that had features like 100 tastes to try in 2008. Add many parties, plane rides and glasses of Champagne, and I rationalized that it was, already, too late to wrap it up. I did put my two cents into the kitty for The Year in Eater, though I did have to page through my calendar to recall what opened and closed and when. My 2008 calendar is already in action. Do you need to read another reminiscence of the year that was? Probably not. Better to have another glass of Champagne bid adieu to 2007 and say bonjour deux mille huit. After a long sabbatical in Michigan and Las Vegas, Takashi Yagihashi returns to Chicagoland. His eponymous restaurant in Bucktown opens today! Full press release and bonus menus after the jump. 2008 is 16 days away. Do you have a plan? Do you have a resolution? Snack has you covered on both counts. 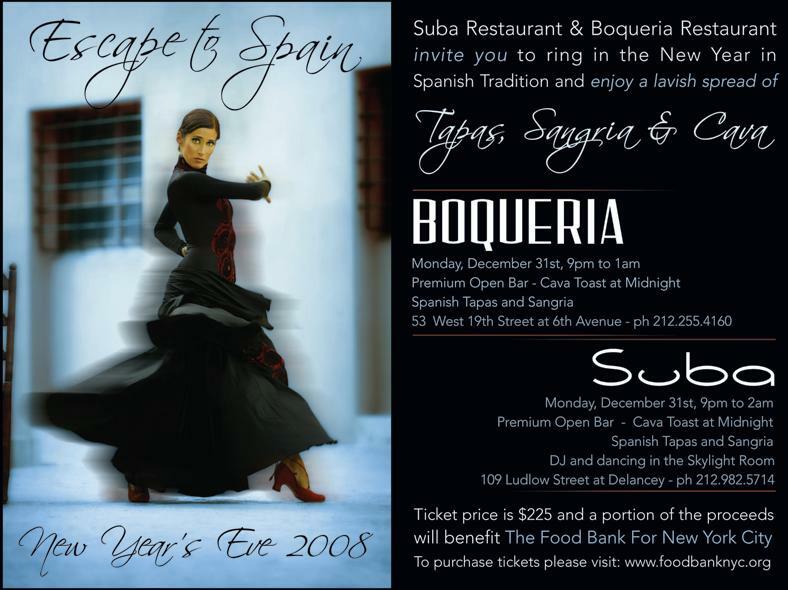 Boqueria the hot downtown Spanish spot is throwing a tapas and Cava fueled fiesta to ring in the New Year. Perhaps you've always wanted to go? But have been daunted by the standing-room only waits for a table. This is a sure thing. Part of the ticket price will go to the Food Bank for NYC, meaning when you raise your glass to toast at midnight you will be able to cross off resolution #12: make a difference in the world by having cocktails. 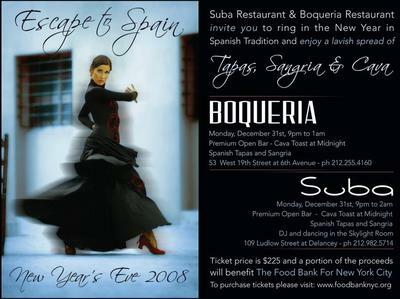 Those looking to get their groove on should head to Suba. Also downtown, also hot, also benefiting the Food Bank, but with a DJ and dancing in the Skylight room. Hands in the air to bring an end to hunger. We've been hearing about Ibérico hams coming from Spain for some time now. It is a big deal because said hams were once unobtainable as they were banned from import into the US. They are the ne plus ultra of pork products. This afternoon, chef and importer José Andrés slices up the first arrivals at his restaurant Jaleo. Full details after the jump.